Beautiful Eel Lake greeted us as we pulled into William M. Tugman State Park. 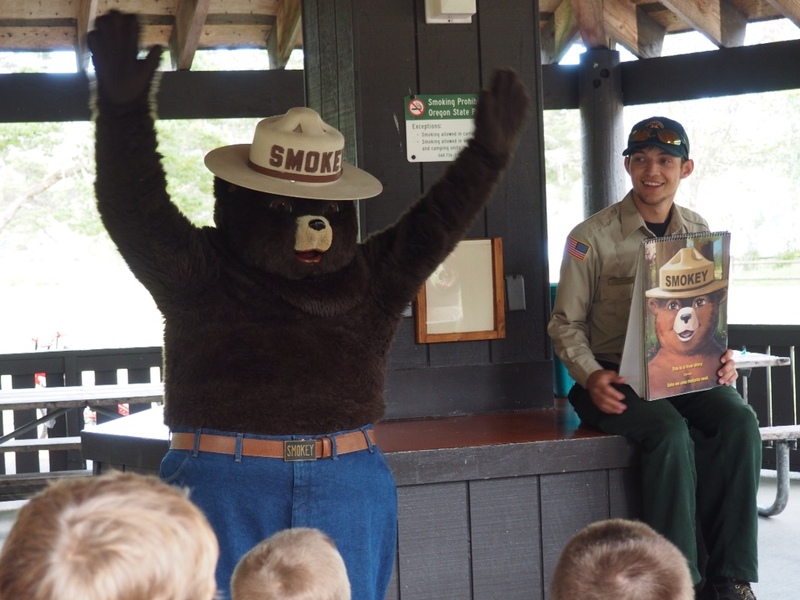 Smokey Bear made an appearance at the ranger program where kids of all ages enjoyed hearing his story. 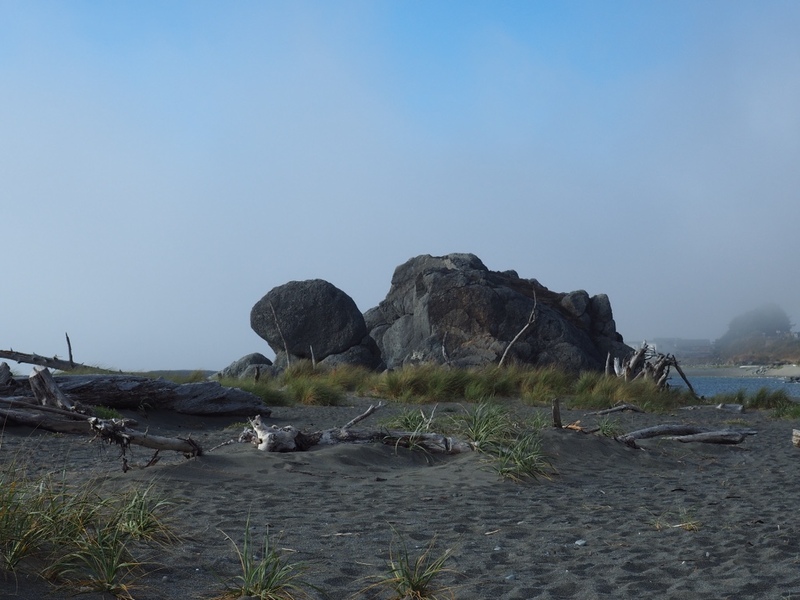 When the temperatures skyrocketed a couple of weeks ago, we hitched up the trailer and headed for the fog and cooler temps that the Oregon Coast is famous for. 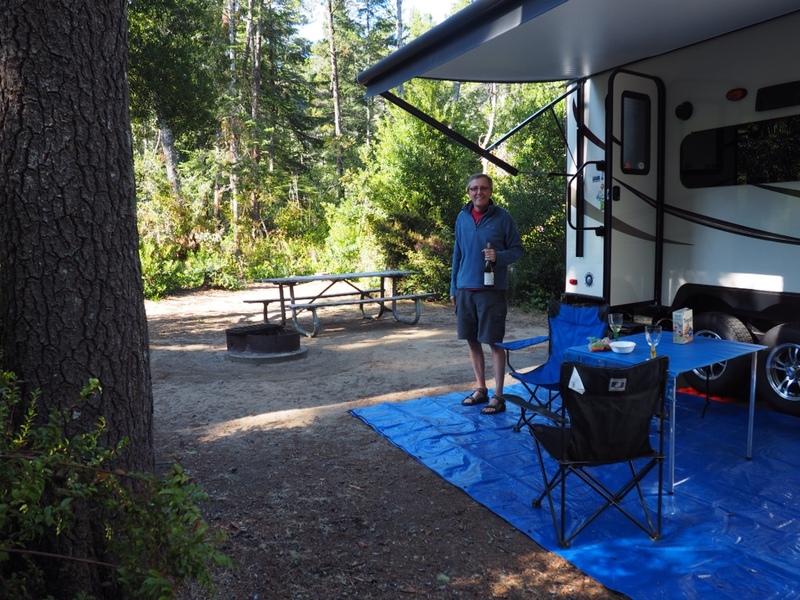 Having spent only two nights at one campground on our maiden voyage last June, we were eager to test our hookup skills on our second adventure – a seven night/three campground coastal tour. 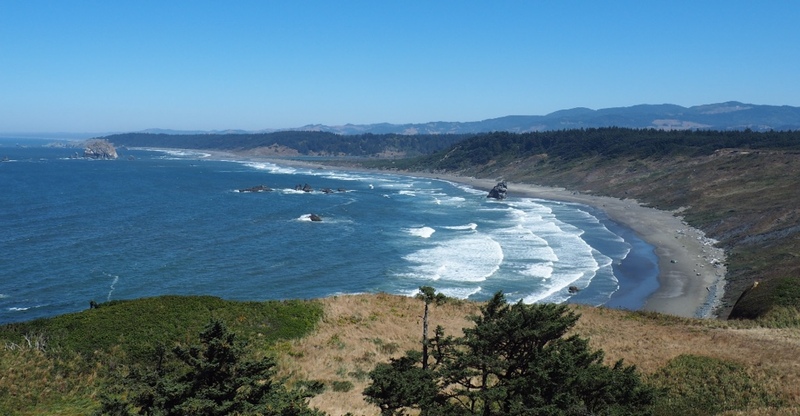 Our first stop was a two-night stay at William M. Tugman State Park, located just south of the town of Reedsport and the Oregon Dunes Recreation area. The campground was clean and neat, thanks to the friendly staff and many volunteers who keep the place running like clockwork. We were pleased to find that fires were allowed in the fire pits and wood was available. 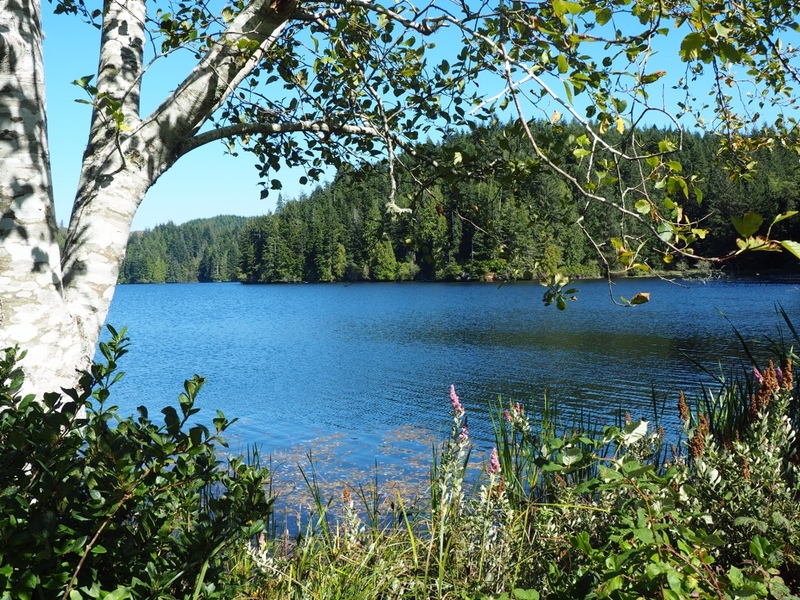 Eel Lake offered fishing, boating and swimming in addition to a well maintained 4-6 mile (depending on which source you choose to believe) shoreline hiking trail. Lighthouse tours are available from April through October if you are able to climb to the top and don't have a fear of heights. A day trip down the coast landed us at Cape Blanco State Park. 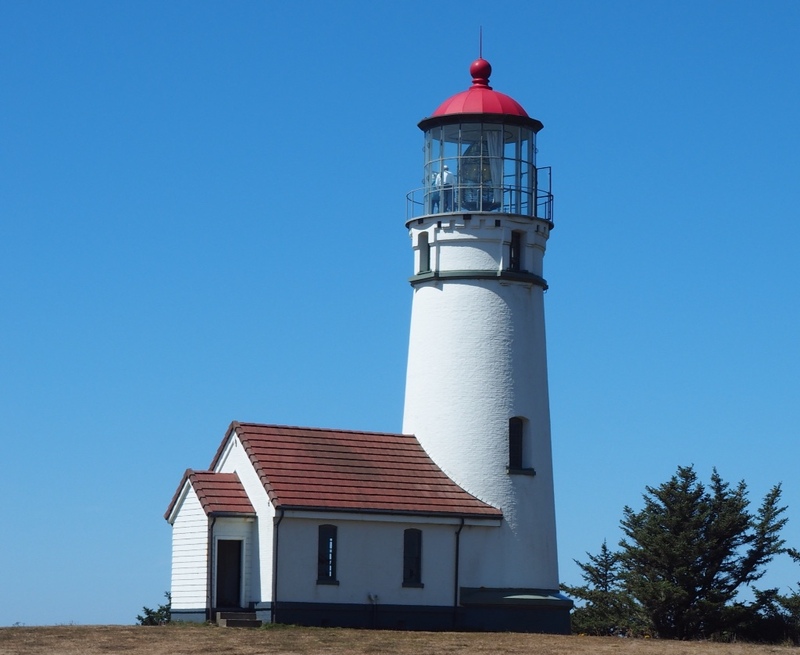 The westernmost point of the 48 states, it is also home to the Cape Blanco Lighthouse. This coastal beacon has been in use since 1870, longer than any other in Oregon. We were fortunate to arrive on a crystal clear day. I poked my head out an open door at the top of the north side of the lighthouse for a quick shot of the coast. If you look really hard you'll find me, feeling small, near the front of the turtle. I could see the turtle more clearly from a distance. 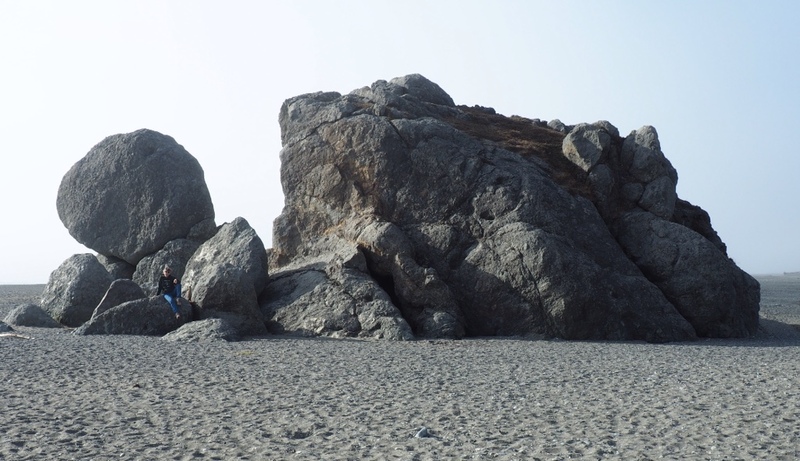 We spent two nights at Turtle Rock RV Resort, aptly named for the massive grouping of rocks that resemble…you guessed it…a turtle. Happy Hour at our campsite. Life is good! Sunset Bay has got to be one of the most beautiful spots along the Oregon Coast. Knowing there were hiking trails, seals and sea lions to see and the beautiful gardens of Shore Acres to explore, were looking forward to the three nights we scheduled here. However, as luck would have it, the fog rolled in early on day one and became our constant companion. An interesting piece of trivia we found posted at the beach of Sunset Bay. The sky finally cleared as we finished dinner on our last night so I grabbed the camera and we hurried out to the beach. Would Sunset Bay live up to its name? We watched in awe as Mother Nature put on a magical show for us! Sunset Bay did not disappoint! We thought we must be close to the top when we came upon a sign that marked the halfway point. 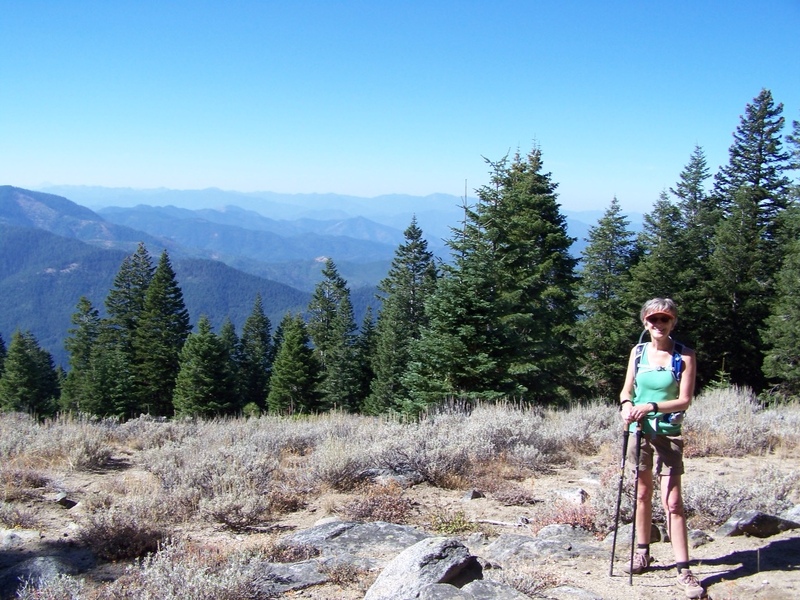 Our guidebook promised the views were well worth the 5.2 mile hike up to the top of Wagner Butte. 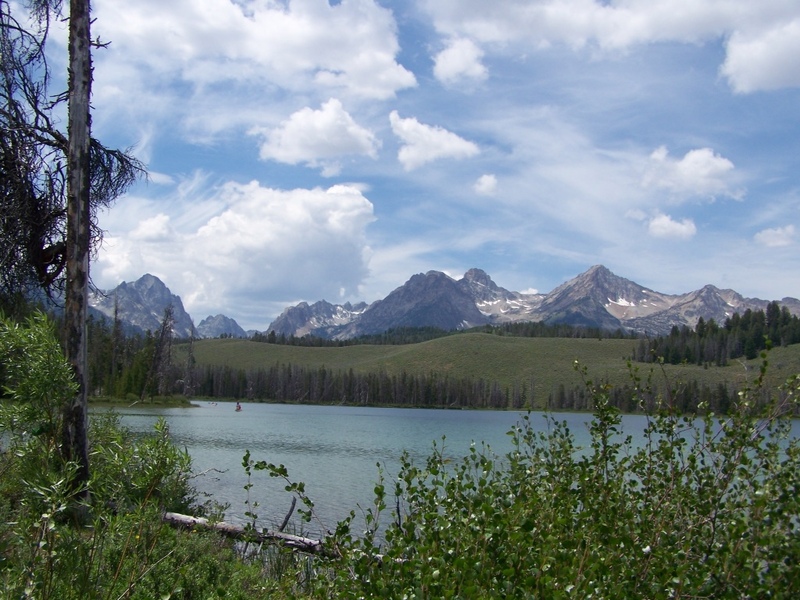 Located west of Ashland, the trailhead was just a short drive from our home, so we packed our lunch and jumped in the trusty Subaru. 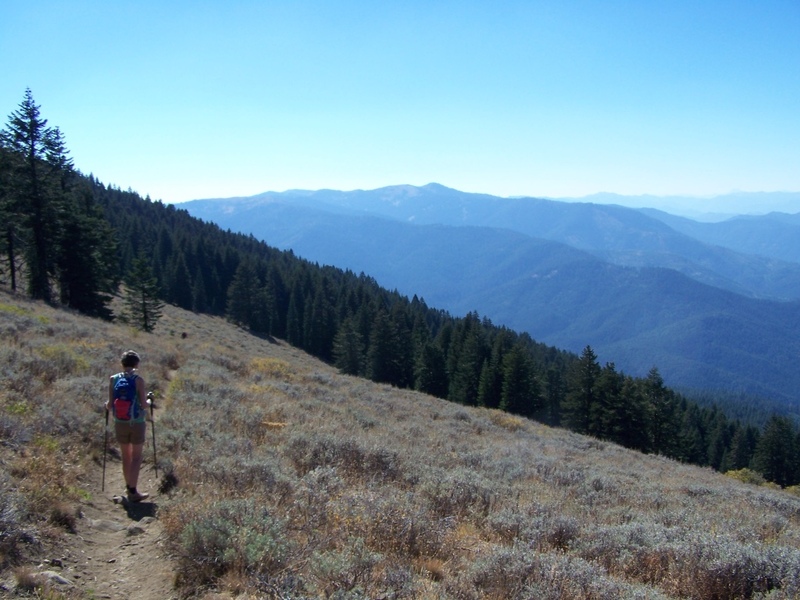 The fall day was sunny and warm, but not too hot…just right for a trek with a 2,200 foot elevation gain. “We can do this,” we assured each other. The trail took us through a forest of old growth firs, across the site of an enormous 1983 landslide, through sagebrush meadows and even a grove of aspens. As we neared the summit we could see Mt. Ashland (on the right) and Pilot Rock (the small knob in the distance). It's a bit of a scramble to reach the top. 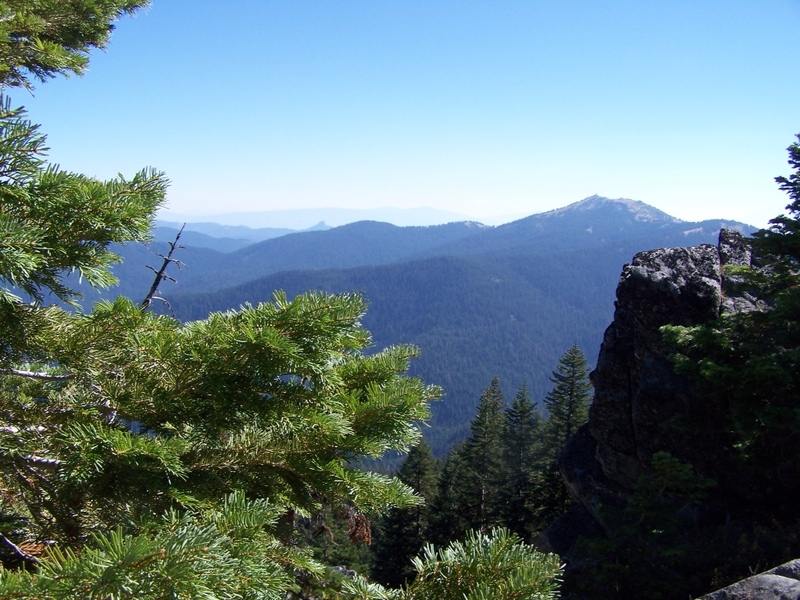 A fire lookout was constructed atop Wagner Butte after a 1910 forest fire threatened Ashland. 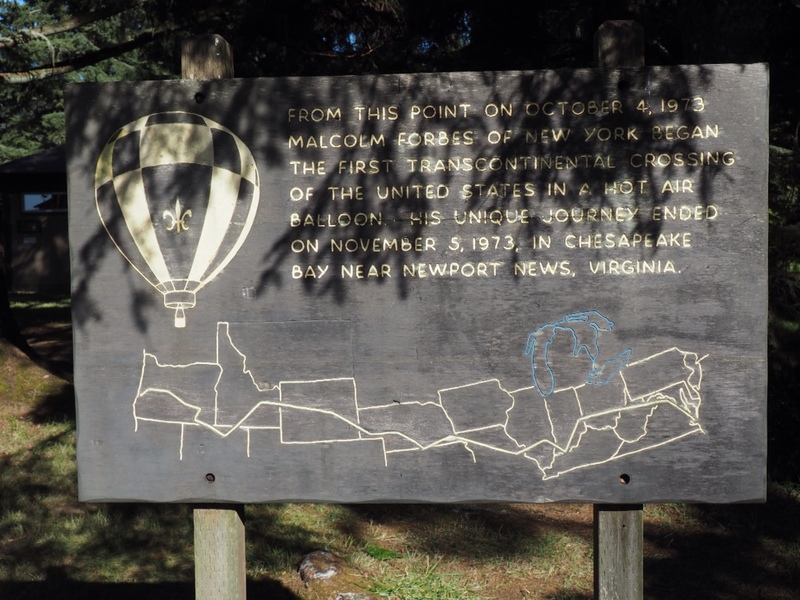 It remained in use until the early 1960s when airplanes began to take over fire surveillance. A leftover railing, old foundation piers and an incredible view reward hikers who reach the top. As we headed back down the mountain, I began to think about returning in the spring. I bet the wild flowers will be beautiful! Who doesn’t like a good deal? We sure do, so when our friend Teri brought the Sun Mountain Lodge mid-week special to our attention, Reg grabbed the phone to reserve our room. 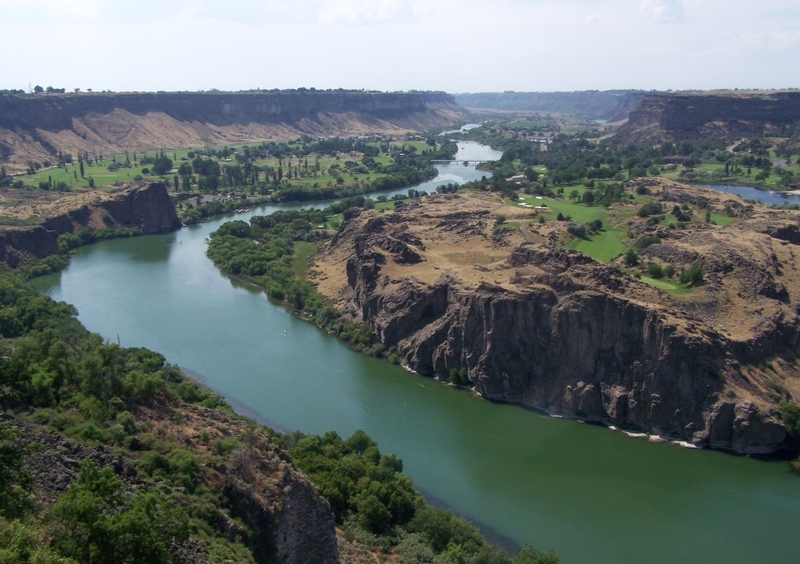 What a beautiful spot…far more luxurious than our usual accommodations, but well worth the trip into northern Washington. The grounds are beautifully landscaped with lots of outdoor seating to relax and enjoy the views. My blue-eyed horse was named White Leg and Reg rode Billy. 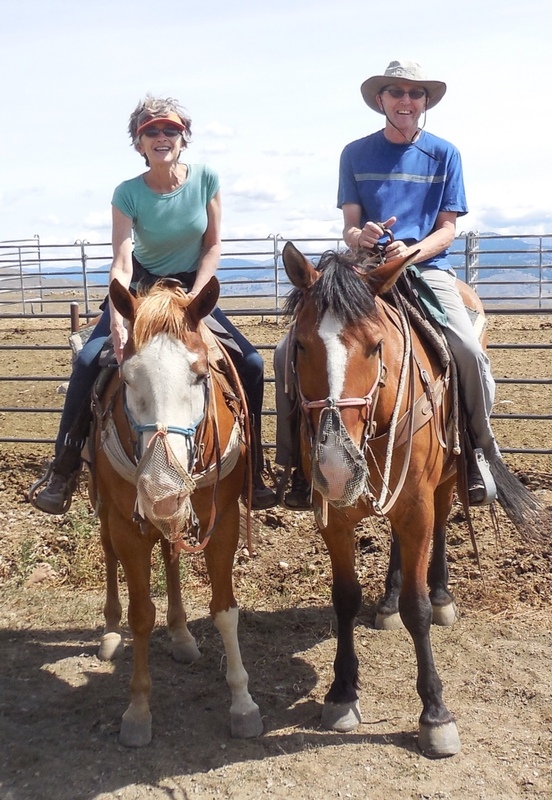 Just down the hill from the lodge are stables where guests can saddle up for a breakfast ride, dinner ride or the simple hour and a half trail ride that we did. 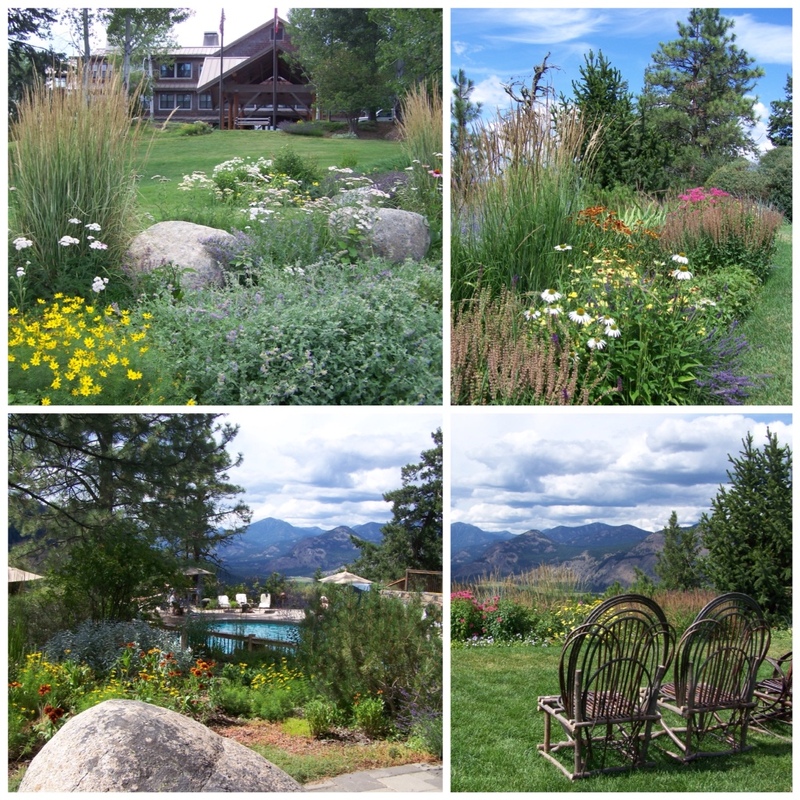 The Sun Mountain Lodge is open year-round with plenty of activities for all ages, both inside and out. If you’re ever in the neighborhood it’s a must see! The brochure promised “It's more fun at Park City,” so we got an early start today to determine if it was true. Our first stop was the Alpine Coaster, an elevated track that winds through more than a mile of twisting turns, racing beneath the trees at speeds of up to 30 mph. After a short lesson on braking and accelerating, we were sent up the hill. 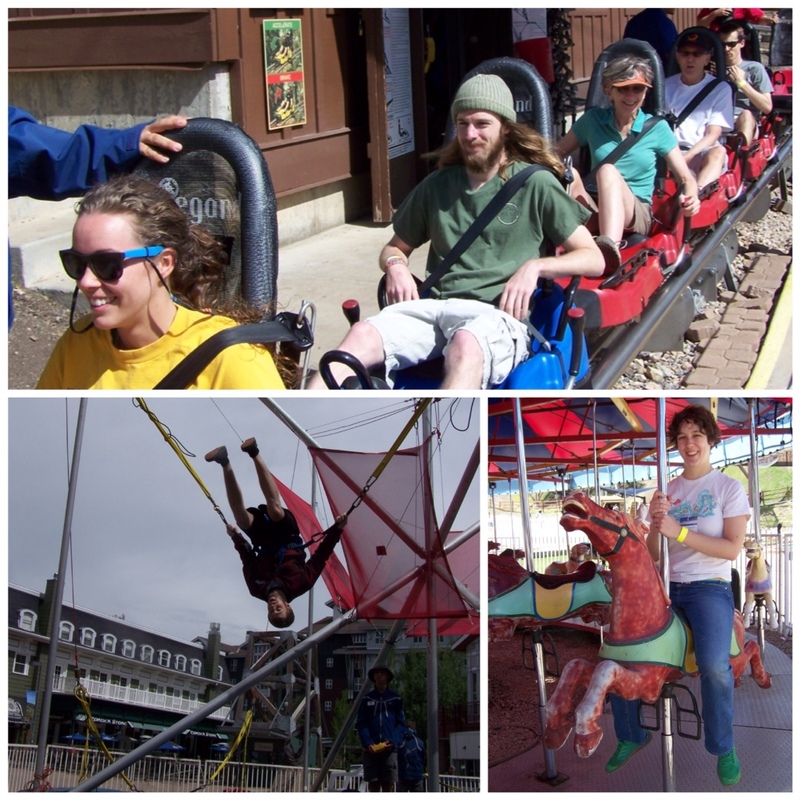 The Alpine Coaster was a hit with us all. Brad was a good sport and tried some flips on the Legacy Launcher and Leah talked her way on to the carousel. 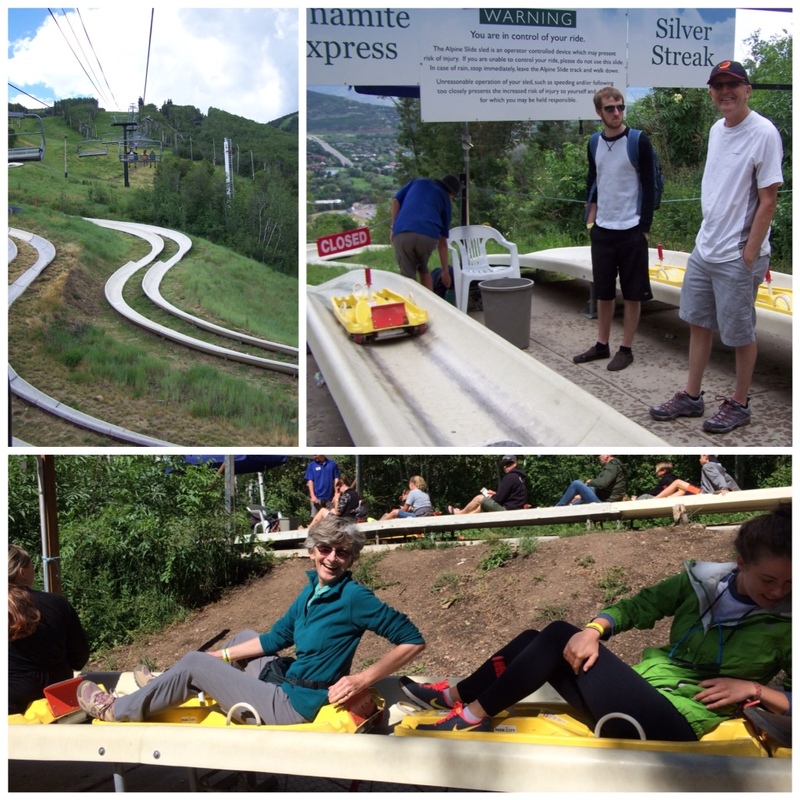 We're not quite ready for the Olympics yet, but we all had a blast racing down this summer sledding course. Warmed up and ready to go, we jumped on the lift and rode up to 8,000 feet for a ride on one of the four the Alpine Slides, a luge-like track that would speed us back down the hill. Our first attempt was rained out, and we were sent back to the bottom in a Suburban. Fortunately, the afternoon sunshine allowed us multiple trips down the mile-long course. We were all warned that the “sleds” will dump you out if you try to go too fast. A couple of us learned (the hard way) it was true…but I'm not a tattletale, so I'm not saying who…you'll have to guess! Unsettled weather like we had today can be a little tricky. There are no refunds when rain shuts down rides. However, even with a little bad weather, our family consensus was seven thumbs up for the Park City Resort. It was a fun day! 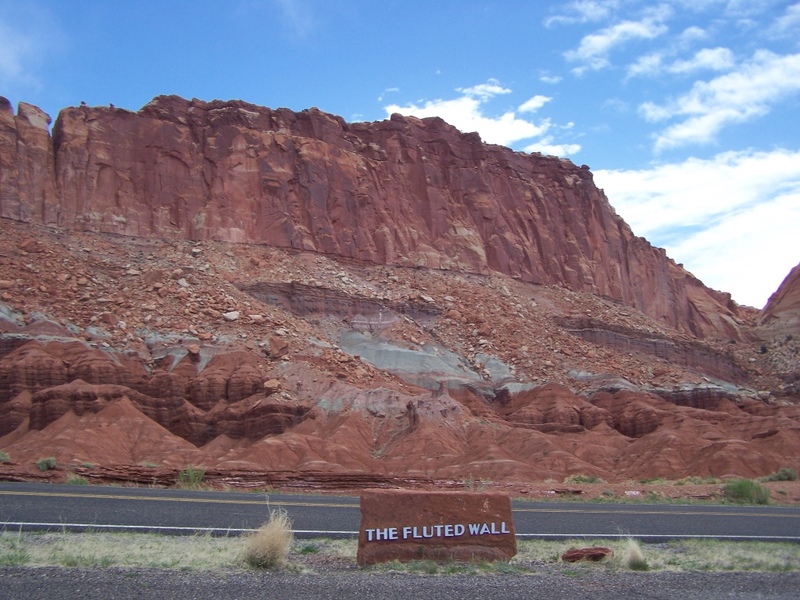 Capitol Reef National Park was established to preserve the geologic features of an area created 65 million years ago. Known as the Waterpocket Fold, this giant wrinkle in the Earth’s crust extends almost 100 miles. 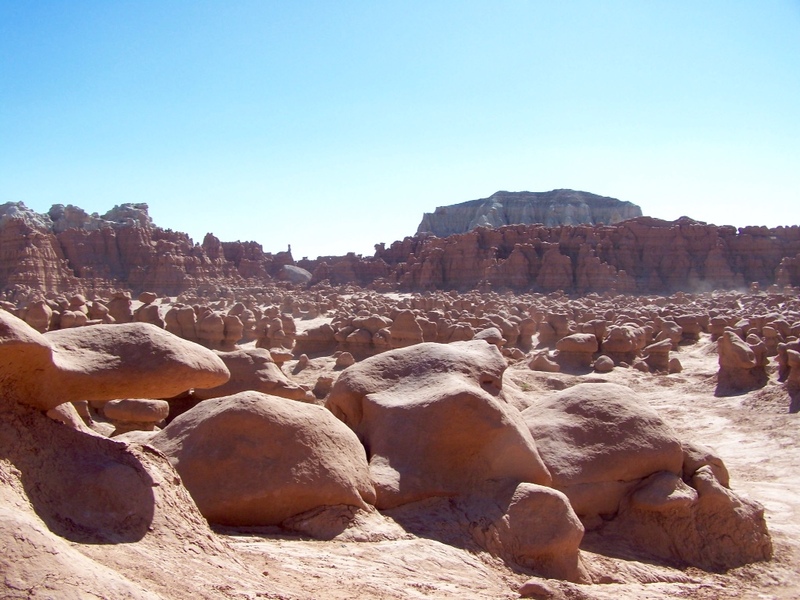 Ongoing erosion has created the park as we know it today. 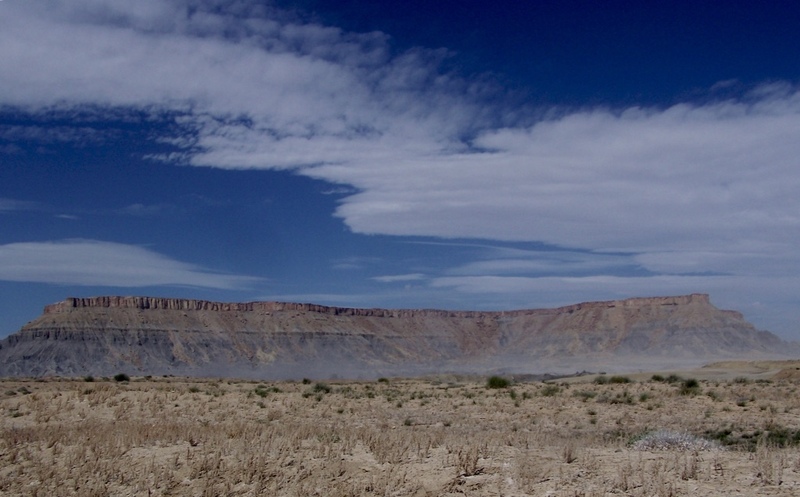 Skies remained blue, but wind blew clouds of dust across the landscape. The wind picked up and the landscape began to change once again as we continued west towards Capitol Reef National Park. Gusts were expected to blow at thirty miles per hour or more. They were strong enough to push our car about while kicking up some mighty big dust clouds. 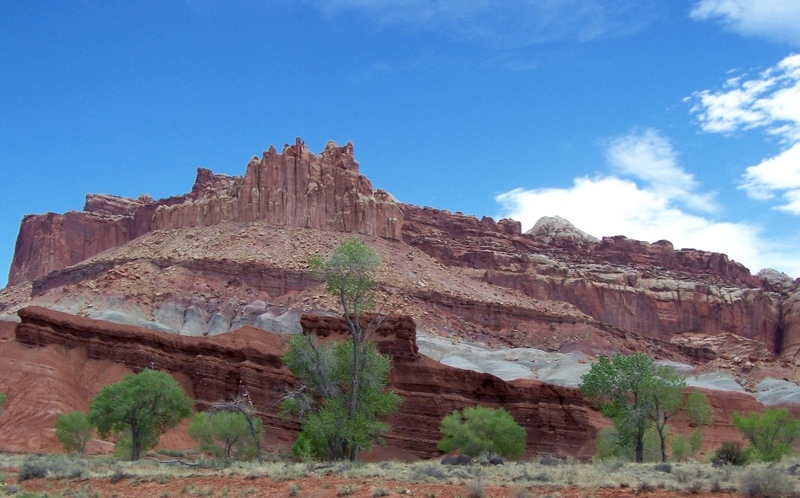 We never saw the Capitol Reef park boundaries, but when we came upon this towering display we were pretty sure we had arrived. A formation known as The Castle towers over the Visitors Center. 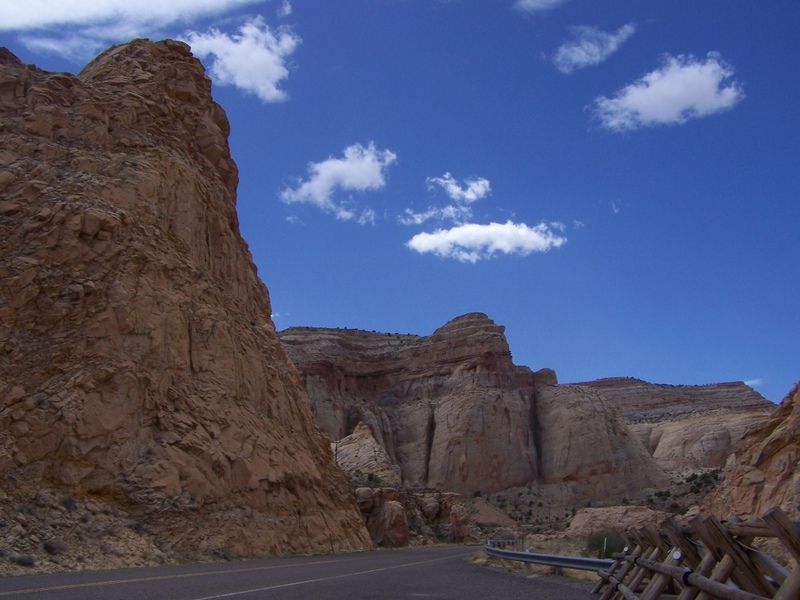 The main road through Capitol Reef isn't long and many spectacular formations can be seen from roadside pull-outs. Weather was changing and the Moab report was threatening snow showers. Gusty winds were also predicted so we packed up and headed west. It was time to get home…but not right away! There was still more to see!! 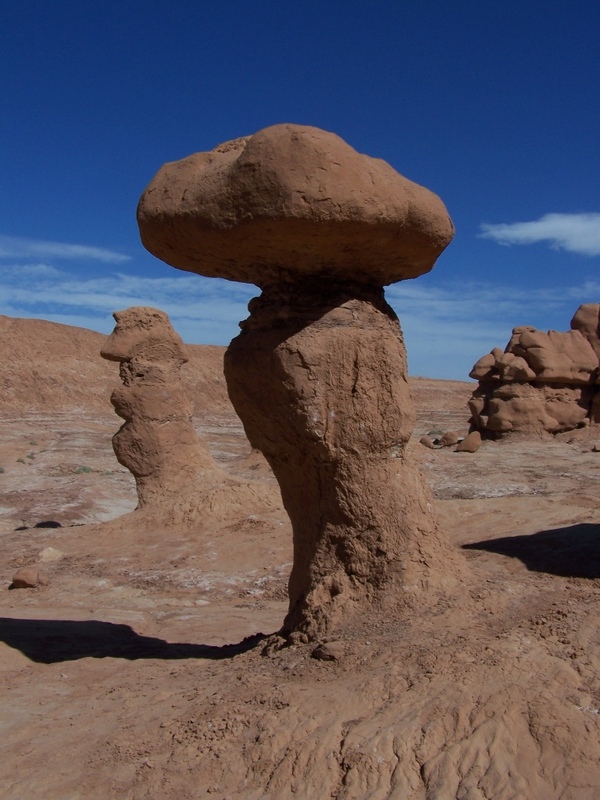 Formations like this are what led Arthur Chaffin to refer to this area as Mushroom Valley when he stumbled upon it in the late 1920s. 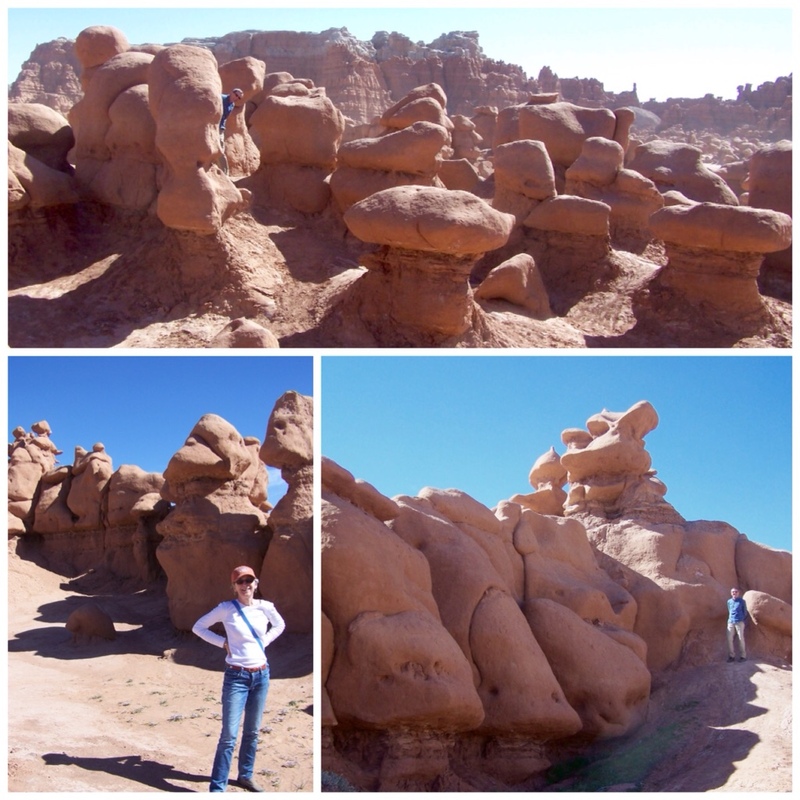 Goblin Valley State Park, in Utah, has been on my list of “must see” attractions since we started talking about our southwest adventure. We had circled all around it and today we made the detour, enduring gusty winds I might add, to visit the Goblins. Deposits from an ancient sea 170 million years ago combined with the forces of nature to create this one-of-a-kind landscape. It almost has to be seen to be believed. The Goblins stretch as far as the eye can see. Top photo: Where's Reg??? We couldn't believe there weren't more restrictions limiting our footsteps as we toured the Goblins.